I know without a doubt you are with me on my excitement over the first cup of coffee of the day. I wake up to my 6 am alarm each day and after stretching for a minute my brain immediately starts thinking of coffee. I literally get excited about that warm cup of strong yumminess. It may be my favorite part of each day when I wake up. 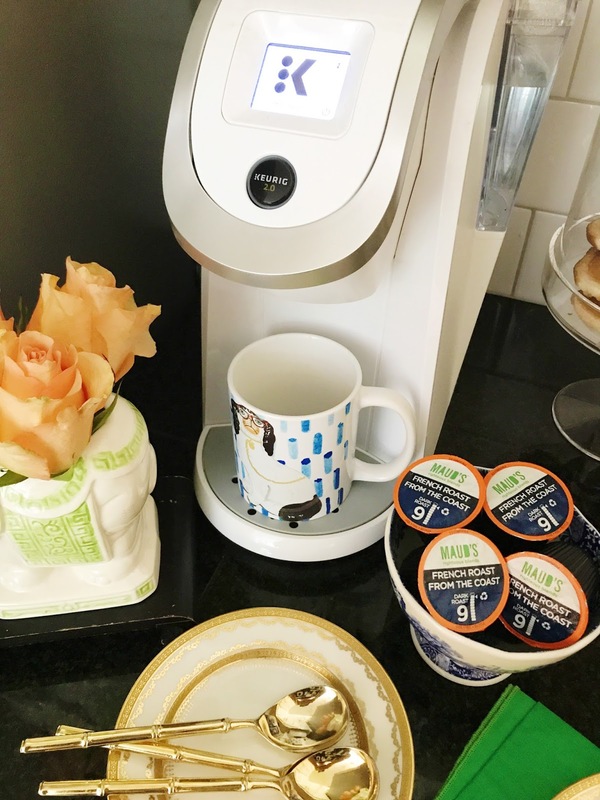 I have shared before that we have a Keurig in our master bathroom for the first cup of the day. Since the children are on the same floor as us it makes sense to manage their mornings while I am still upstairs before going down for the morning. I learned that the moment I would go down to the kitchen was the exact moment one of them couldn't find their fill in the blank. Out of a necessity when Lawyer traveled for five years I treated myself to a small coffee section in the bathroom complete with bottled water and my coffee pods along with a mug for the morning so I was better prepared to tackle the day. Of course when I head down for the day I get my second, and sometimes third, cup from the kitchen. 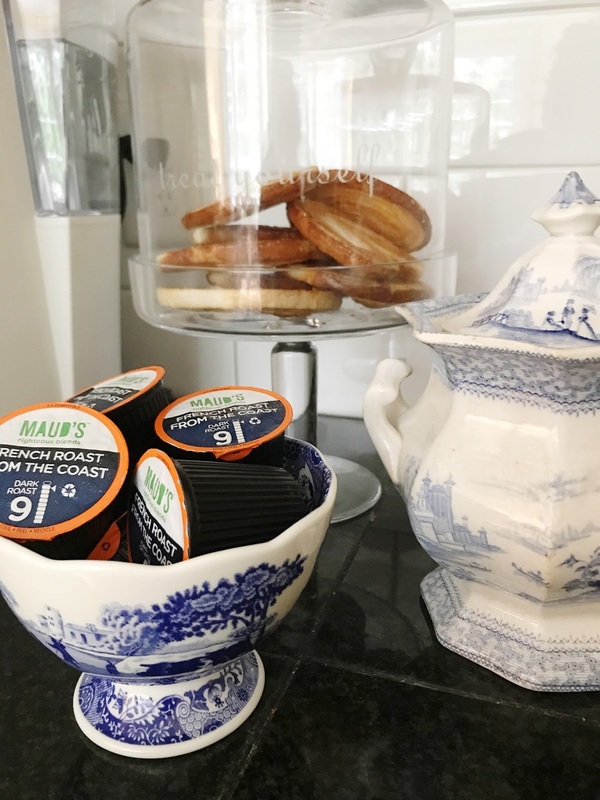 Last week I decided to set a coffee bar for Saturday morning so I would be prepared for the next morning with berries and some treats for coffee time. 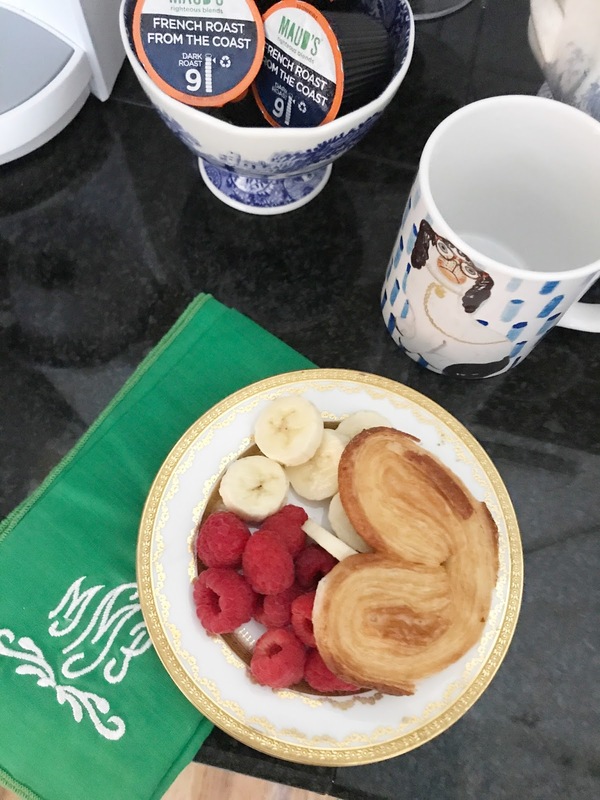 Typically on Saturday some of us sleep in and we eat brunch much later so a little plate of fruit and a palmier was perfect for my early wake up call. As I set up the space I realized it was something I do quite a bit and it was time to share it with you. A little vase of flowers, a couple of darling plates and a stack of monogram napkins and it was done. So easy to do and so fun to walk down to in the morning. I felt as if I was in a boutique hotel and someone had set it out for me. As the kids woke up and headed for juice, hot tea and coffee they all had the same response, "are we celebrating something?". Yes, my loves ... I am celebrating you! Setting up a coffee bar is truly very easy and something you can set up with just a quick trip to the market. A container of raspberries, some bananas and a box of baked happies and I was ready. I had already purchased flowers for the week, but if you don't have any at the house then you would need to add that to your cart as well. 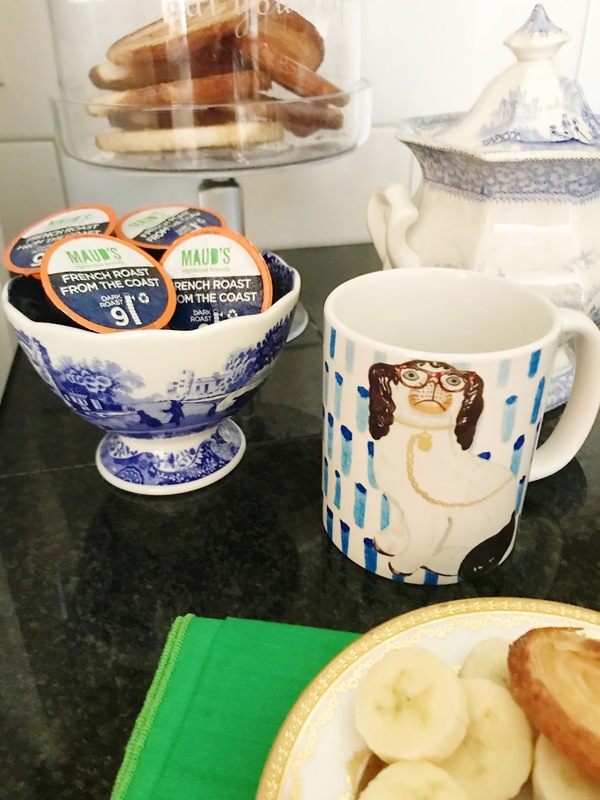 I added in a stack of fun plates, some fabulous flatware, napkins (go with the monogrammed ones) and a bowl to display the star of the morning ... my favorite coffee! I only put out my mug for the day since they like to choose their own. 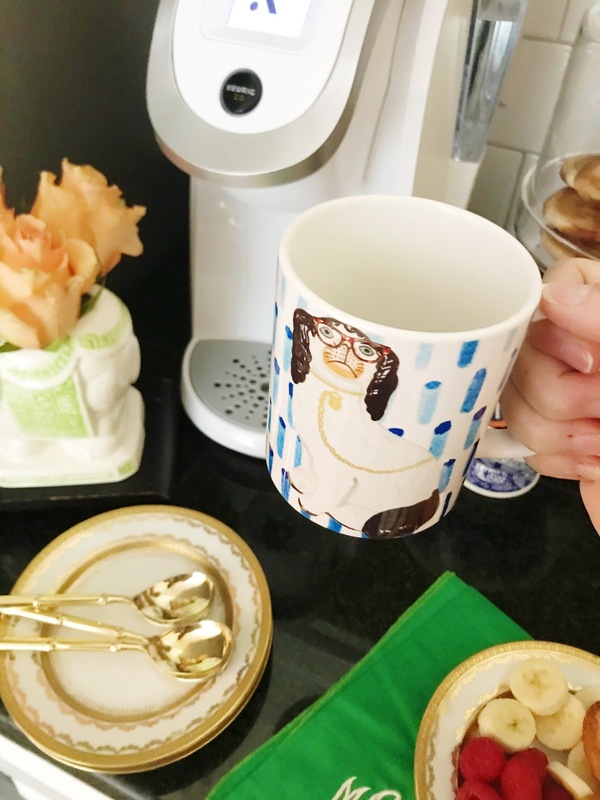 This mug is my favorite, but who wouldn't love a mug with a darling pup in spectacles. Isn't he precious? 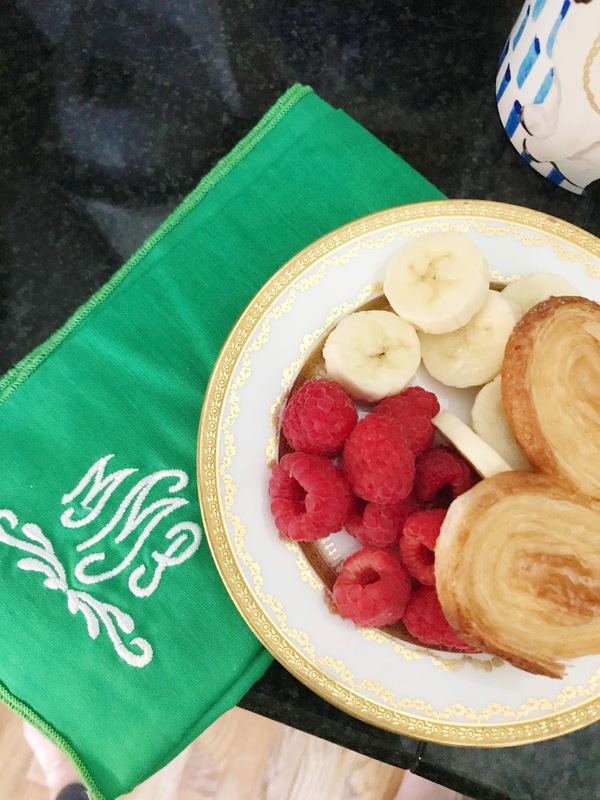 Little Bit chooses a monogram mug and the boys choose something different every time. Lawyer seems to gravitate towards his Mr. Handsome mug which make me happy. I love when they use a fun gift! I truly do love Intelligent Blends coffee and I love that it comes in a large box of 100 pods. It makes it easy for me to always have my favorite blends on hand and not be concerned about running out with a smaller box. 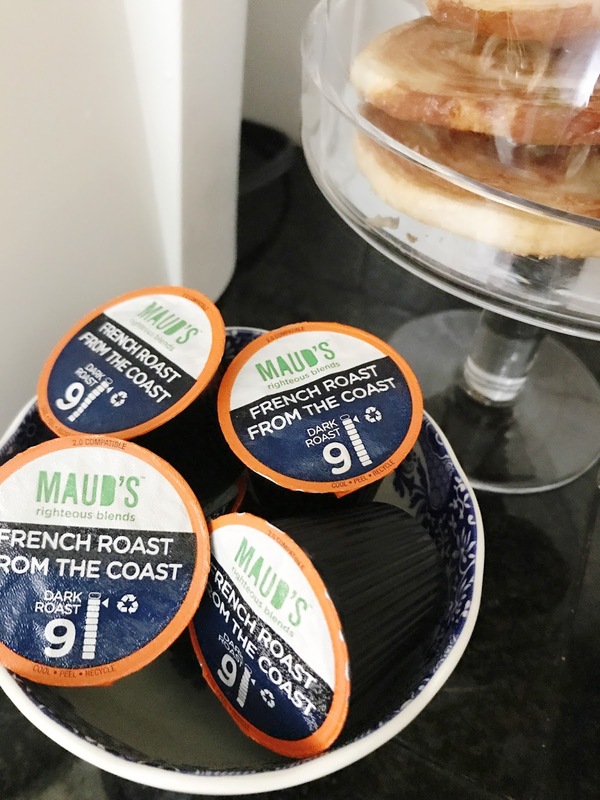 My favorite blend is the Tall, Dark & Handsome but I also a huge fan of French Roast From The Coast and Express-O Yourself. I like dark coffee and I cannot lie!!! And with all of my ingredients pulled together, some fun things pulled from my stash and it was ready for the morning! I may have been more excited on Saturday for coffee than I normally am and that is a huge thing for me. Coffee in the morning is my happy time for sure!! 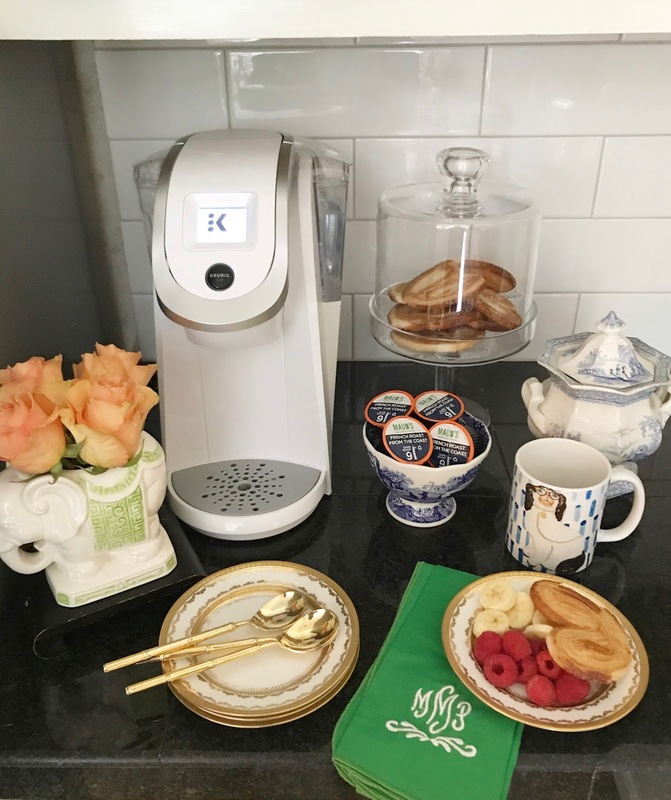 Treat yourself to a fun and quick coffee bar ... you will love it and so will your people! 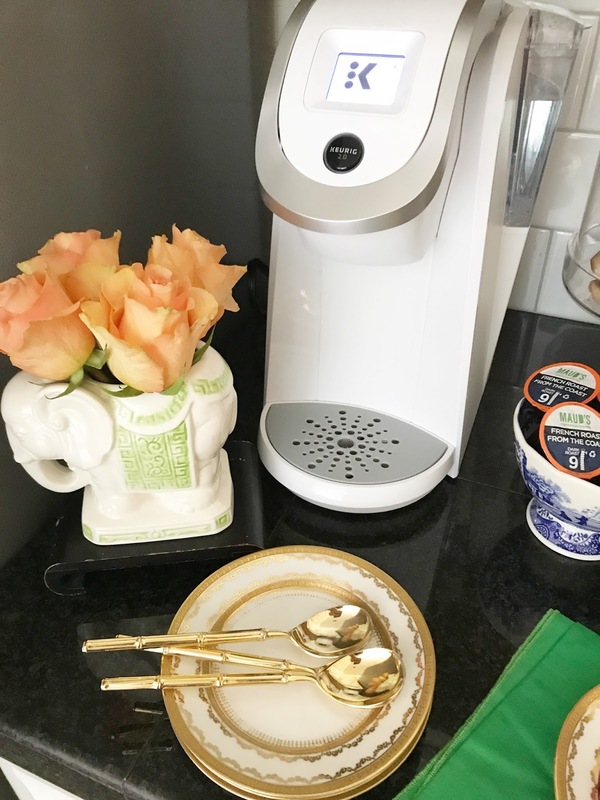 Ever since you shared that you have a mini coffee bar in your Master bath, I have been hunting for a spot to create one in our bath/bedroom. Don't have a lot of counter space in our bath, but am thinking of adding a bar car in the corner of the bedroom. I am sure your sweet family appreciated the gesture.